Those who own vintage or other luxury vehicles understand that such possessions require additional care during maintenance, transportation, and storage. At the top of the list of priorities is protection - against theft as well as elements that could cause either interior or exterior damage. Many owners of prized vehicles simply do not have the space to store their cars at home. In such instances, the self-storage option is ideal. 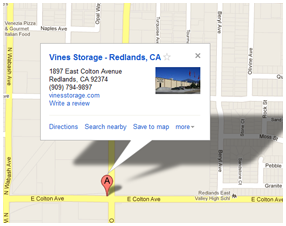 We provide convenient and secure storage in the Colton area, with both indoor and outdoor facilities. Once you decide to place your vehicle into long-term storage, it helps to have a checklist of pre-storage tasks so that nothing is forgotten. Failure to complete certain steps can result in irreparable damage to a vehicle. A clean vehicle is a healthy one. Before storage, your car should be cleaned inside and out, and thoroughly dried, especially if a cover will be used. Many people care for the exterior of a vehicle, but neglect to give attention to their car's interior spaces. A clean interior is less likely to develop mildew or mold, and will be less attractive to mice. Fresh gasoline can be placed in the tank of a vehicle that will be kept indoors or outdoors, as long as temperatures do not exceed 80 degrees Fahrenheit. Other important fluids that should be changed include oil, brake fluid, power steering fluid, and antifreeze. When changing the oil, installing a new oil filter is recommended. Many experts recommend placing a cover on a vehicle only when it will be kept indoors, where the temperature is better controlled. Even high-dollar car covers are capable of trapping moisture, posing potential harm to paint. Before long-term storage, tires should be inflated to their recommended pressure as listed in the vehicle's manual. This will decrease the risk of flat spots, although it cannot guarantee total avoidance. The pressure of the vehicle on tires builds up over time, faster in colder temperatures or on low-profile tires. Ideally, a stored vehicle should be driven every now and then, elevating internal temperature and eliminating the beginning of flat spots. Should a severe flat spot occur the tire would need to be replaced. Another option for long-term storage, more than thirty days, is to place the car on jacks, removing all wheels and storing them lying down. Although more work, this approach is ideal when driving the vehicle periodically is not possible. Much thought and preparation goes into maintaining a classic or luxury vehicle. All measures are designed to keep a car safe and in optimal operating condition. Contact Vines Storage to find your best method of storing your prized vehicle.